Payments | J.J. McLellan & Son "
We appreciate our customers and for your convenience we offer the following payment options. JJ McLellan’s office location is 695 Queen Street West in Mount Forest. We are located at the corner of Sligo Road and Queen Street (Highway 89) on the edge of Mount Forest. Our sales and service desk entrance is located at the right side of the building, you will see a grey door marked Plumbing & Heating Sales and Service. Please do not mail cash or your credit card number. 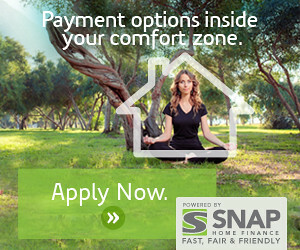 Up to 100% financing for all your home comfort needs No down payment necessary Variety of financing offers including: No Interest No Payment programs Low Monthly Payment Programs Open Loan – Pay off the entire loan at anytime without penalties Personal and Confidential Easy deductions from your bank account Take up to 10 years to pay. The following information will be taken for the work order(s) – Name, Address, Mailing Address (if different), Phone Number, Cell Number, Work Number, Email. New customers may be asked for a credit card which is used for a pre-authorization prior to the work being complete. If you provide us authorization to do work when you are not home this will represent your signature acceptance on the work order. All goods (materials and equipment) remain the sole property of JJ McLellan & Son until the invoice has been paid in full. In store counter sales must be paid for at the time of purchase. Only customers with an in-house approved and current account will be authorized to charge for over the counter products. Travel time is invoiced and there is a minimum 1 hour service diagnostic charge. If a part has to be ordered there will be a variable wait time and additional labour charges in addition to the service diagnostic charge to install the part. All charge accounts for products and/or service are due upon receipt of the statement and/or within 21 days of the job completion whichever comes first. All accounts with a balance owing are subject to a 2% per month / 24% per annum interest charge. Accounts over 90 days may be submitted for Collection with the Owen Sound Credit Bureau. Gas parts cannot be sold over the counter without a valid TSSA Gas License. Unopened items in original packaging returned with an original invoice within 30 days of purchase will receive a refund to the original method of payment or will receive an exchange. Items that are opened, damaged and/or not in resalable condition may not be eligible for a refund or exchange. Special order items are considered final sale and cannot be returned. A defective item is subject to the manufacturer’s warranty and will be repaired or replaced as per the manufacture’s policy. Any defective products must be accompanied by the original invoice of purchase. Warranty of a product installed by our technicians will be subject to the manufacturer’s warranty. We cannot warranty or accept returned products purchased at another store. Equipment or appliances which have not been regularly serviced or maintained may void the manufacturer’s warranty.